This article first appeared in Personal Wealth, The Edge Malaysia Weekly, on November 26, 2018 - December 02, 2018. A growing number of people are finding the idea of retiring at 60 a challenging prospect and are opting to forgo retirement altogether so they can better manage their finances. This concept, known as “unretirement”, aims to change how people think about old age and how to plan for their golden years. Unretirement may be a necessary model to adopt in Malaysia, particularly with the many challenges facing prospective retirees. Felix Neoh, a licensed financial planner and vice-president of client advisory at Whitman Independent Advisors Sdn Bhd, says Malaysians’ willingness and ability to work beyond the official retirement age of 60 bodes well for their long-term finances, especially in the light of increasing life expectancy. “According to the Department of Statistics, the average life expectancy was 72.7 years for men and 77.4 for women last year. As the country’s official retirement age is currently 60, one could spend 13 to 17 years in retirement — or more, as is evident by more Malaysians these days,” says Neoh. This is especially important as a huge proportion of Malaysians cannot afford to retire. In January last year, the Employees Provident Fund (EPF) increased the minimum amount its members should have in their accounts at age 55 to RM228,000 from RM196,800 previously due to the rising cost of living. However, the majority of EPF members have less than RM50,000 in their accounts at the age of 54. This is considered alarming as Malaysia is becoming an ageing nation. According to the Department of Statistics, the population is expected to reach 41.5 million by 2040. Of this, 14.5% will be 65 years and older. Filial piety is deeply ingrained in many Malaysian families. However, with the higher cost of living, many may not be able to support their parents in their retirement, says Gavin Teoh, advisory and practice director at Standard Financial Adviser Sdn Bhd. “A study shows that the dependence on parental support from children, or the net familial transfer, has become challenging in the light of the high cost of living. That is why in a conventional retirement plan, we usually exclude this dependence on familial support and focus on personal asset accumulation, taking into consideration public transfers [inflow received from the government, cash and in-kind contributions] in our retirement planning,” he says. It does not help that most Malaysians do not have enough time to accumulate sufficient retirement capital. Citing a study by Universiti Putra Malaysia on the National Transfer Account (accounting framework of economic flows from one age group or generation to another), Teoh says one’s productive years are from age 26 to 57 — or only 31 years. “It is very challenging to accumulate enough retirement capital in these 31 years, especially when one is pursuing a better lifestyle, supporting the children’s education and having other commitments. This person will face a deficit in this lifecycle during his retirement and it will be intensified by an expected longer lifespan and worries about limited public transfers,” he adds. As those who choose to unretire will most probably work until they are no longer physically able to, their financial planning will be different from those who choose to retire at the conventional age, according to Rajen Devadason, a licensed financial planner with Manulife Asset Management Services Bhd. “Funding retirement is generally going to be difficult because of longevity risk. Those who choose to stay unretired will by definition continue working for longer, allowing them to earn more money for a longer period. This, in turn, means that they will eventually need to fund a shorter period of genuine retirement when there is no active income,” he says. Neoh concurs. He says that having a longer runway to build one’s retirement nest egg will take away the pressure most working adults face in having to spend for today’s needs while saving for their golden years. It will also reduce the financial pressure of being part of the sandwich generation — those who care for both their parents and children. It is highly likely that those who chose to unretire will either become freelancers or entrepreneurs as these are the only two options that will allow them to work beyond the standard retirement age in the country, says Teoh. So, it is important for them to ensure that the income generated is sufficient for their consumption in their old age. Otherwise, they will need to plan ahead and save money to supplement their consumption, he adds. “Furthermore, in our country, the financial market is not well developed yet with the availability of special financial products or solutions that would allow us to convert existing financial assets into cash assets for old-age or retirement needs such as reverse mortgages and life settlement for insurance policies,” says Teoh. A reverse mortgage is a financial agreement in which a homeowner borrows against his housing equity and receives monthly payments while still living in the home until he dies or moves out. No mortgage payments are required as the home serves as collateral. A reverse mortgage product was previously introduced by a local lending institution, but it was taken off the shelf later. In terms of investments and portfolio allocations, those who unretire may prefer to take more risk as there is no deadline for the utilisation of their wealth accumulation, says Teoh. He recommends having a risk-adjusted portfolio that meets their expectations and objectives, with the possibility of skewing towards equities for long-term holdings. Ideally, those who unretire can reduce the volatility or risk of equities as they have the advantage of being able to hold them for the long term, says Teoh. However, this requires them to have strong holding power and the ability to remain rational to avoid being influenced by any emotional or cognitive biases when making investment decisions. “Obviously, any investment planning is not done for income replacement during their senior years. Rather, it serves as a contingency fund for any catastrophic event of loss of income or to supplement their income for their lifestyle expenses in their golden years,” says Teoh. Neoh, however, says it would be prudent to adopt a more traditional approach when planning one’s financial road map. “At the very least, those who unretire should aim to be able to cover the key retirement-related expenses by the standard retirement age. One should aim to have enough resources to retire financially even if he does not choose to retire physically,” he adds. How will choosing to unretire affect their long-term goals such as paying for their children’s education? Citing a study by Dr Ronald Lee of the University of California, Teoh says there is high tendency for parents who are unretired to have a similar focus as those who plan to retire at the standard age, given the declining fertility rate. “And that is to spend much more of their wealth on healthcare and education for their children than the previous generation did. Investing in human capital by providing higher education for their children has become the top priority in family financial planning, regardless of whether the parents plan to retire or unretire,” he adds. In fact, says Teoh, the high expenditure required for their children’s education may affect the retirement funds of parents who plan to retire at the traditional age. Many of them are sacrificing a portion of their EPF savings to fund their children’s education, which causes them to delay their retirement plans. “If it is done through debt financing, the unretired parents will find less pressure to manoeuvre this financial need to repay the debt. They will also worry less about the lifestyle expenses they will incur in their senior years, with the expectation of continuous active income supporting them,” says Teoh. Nevertheless, there are more cost-effective options available to parents today, he points out. This includes online education channels, on-the-job vocational training and employer-sponsored education, which are becoming more mainstream and disrupting the traditional tertiary education route. Thus, big-ticket expenses such as tertiary education may not be as daunting in the future. Choosing to unretire does come with its own set of challenges. For example, banks may not be willing to extend loans to those beyond the age of 70 even if they are earning a stable income, says Neoh. Employers, on the other hand, may be concerned about the high salaries of those in this age group due to years of salary increments and possible increases in medical costs due to age-related illnesses. Today’s mortality rates tend to be lower than decades ago so people may outlive their retirement funds. While unretirement may seem like a viable option, it may be risky if those who choose this route do not have much savings and solely depend on their active income. “They may not able to shoulder the workload with the energy they have in their old age. Their health condition may distort their objective of being unretired and cause financial risk. If they have a service contract or are working for others, they may find it difficult to overcome the pressures and challenges of the job engagement,” says Teoh. Recently, two movements have been challenging the concept of traditional retirement. One is unretirement, where people choose not to retire so they can enjoy more flexibility when it comes to their finances. The other is achieving financial independence and retiring early (FIRE), where adherents live frugally and invest their savings to retire very early. The first movement advocates that one should not delay gratification and live in the moment as there will be plenty of time to save later. The second proposes the virtues of working hard and extreme saving to be able to retire early and enjoy life to its fullest thereafter. Financial planners Personal Wealth spoke to have differing opinions on which option is better. 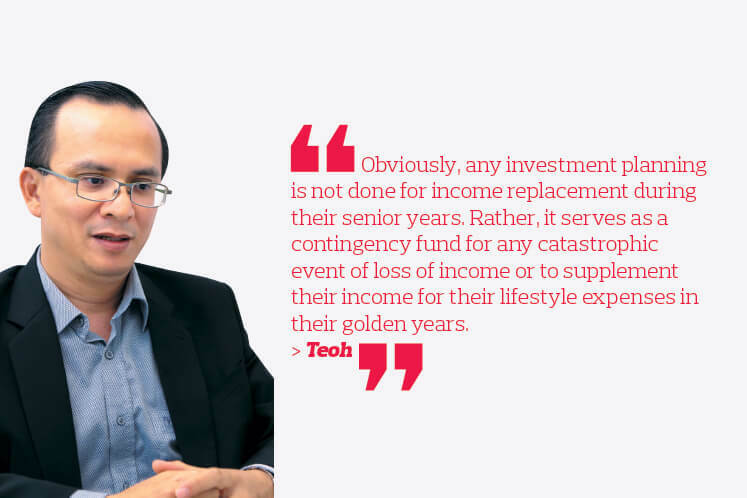 Felix Neoh, a licensed financial planner and vice-president of client advisory at Whitman Independent Advisors Sdn Bhd, says it is safer to plan for a traditional retirement and unretire by continuing to work beyond that age if they want to and if they are able to. “FIRE may be fine provided you that you are not sacrificing too much today to retire early. On the other hand, unretirement is risky due to the assumption that one is able to work until they are much older. This may or may not be true, but you do not want to pin your retirement security on it,” he adds. Neoh highlights his concerns by illustrating with the safe withdrawal rate (SWR) method, which has been used by those who opted to retire early. SWR is defined as the estimated portion of money they can withdraw from their investments each year so as not to deplete their retirement funds even if they retire when the economy is not doing well. Typically, the recommended amount of withdrawal is 4%. This method is not very solid, says Neoh. For instance, the 4% withdrawal rate recommended very much depends on the market conditions during the initial withdrawal years. If the market is underperforming, one should withdraw less, he adds. Additionally, the investments recommended by this method only take into account two asset classes – equities and bonds. It does not include other investments such as real estate and alternative assets that could complement one’s portfolio. The advantage, however, is that a FIRE retiree can always choose to work part-time to minimise the withdrawal of their retirement nest egg. “Conversely, unretirement may sound attractive. But that is only under the assumption that one is able to continue working until later on in life. Will the person be physically able to? If not, then will the person have accumulated enough to fund their long retirement?” says Neoh. However, Rajen Devadason, a licensed financial planner with Manulife Asset Management Services Bhd, is a clear proponent of the unretirement movement. “In my opinion the FIRE movement is, for most people, unrealistic and a waste of vast human potential for economic and societal uplift. In contrast, I believe the unretirement movement is a great way for older people to continue living well while contributing to society,” he says. Money may seem like the most obvious reason people choose to unretire. However, San Francisco-based certified retirement coach and consultant Janet Kodish points out that this may not necessarily be the case. She says she was financially prepared for retirement and thought it would be a breeze — until she realised that she was not prepared for the massive change in her lifestyle. “I had the money part figured out, but I had not appreciated how much meaning and social connection my job gave me. My life’s purpose had come so easily when I was working. It gave me a schedule, wonderful colleagues, the opportunity to use my noggin and the conviction that I was doing good and worthy work. I did not anticipate the effort that would be required to recreate these on my own,” she adds. In her retirement, Kodish found that she needed reasons to get out of bed in the morning. So, she decided to do everything she could – she volunteered, become a board member, did some consulting and developed plans for businesses. She finally settled on becoming a retirement coach and helping clients design their retirement road map, with the objective of getting them through their transitions quicker and with less angst than she had experienced. “Some people, when they choose to unretire, go back to their previous careers. But often, they look for something more fulfilling. We are looking for flexibility and work-life balance. We want to do something we find satisfying and gives us a sense of purpose,” says Kodish. Julian Ng, CEO of Main Street Capital and a financial consultant, has considered himself an unretiree for the past decade. To him, unretirement is a variant of early retirement – one could have many retirements in life rather than having just one big retirement, which in many cases puts more stress on one’s working life. “With unretirement, you are still working, and may not ever stopping work, but doing something you like and giving yourself the flexibility to enjoy life. This evens out the stresses and enjoyment,” says Ng. As unretirees choose to continue working beyond the conventional retirement age, it pays for them to invest in their human capital by maintaining their skills and adding to their education, says Rajen Devadason, a licensed financial planner with Manulife Asset Management Services Bhd. “Even if health and fitness do not become limiting factors, only those who are committed to lifelong learning in their chosen fields will be able to stay economically relevant enough to retain their jobs or run their businesses in the decades ahead,” he adds. In the future, the competition older people will face will not only come from younger and quicker workers. It will also come from artificial intelligence-driven robots and self-learning systems. Hence, the importance of ongoing education and upskilling, says Devadason. Felix Neoh, a licensed financial planner and vice-president of client advisory at Whitman Independent Advisors Sdn Bhd, agrees. He cites top Wall Street adviser Ric Elderman’s most recent book, in which he anticipates mini-retirements, career changes and lifelong learning to be the norm in the future. 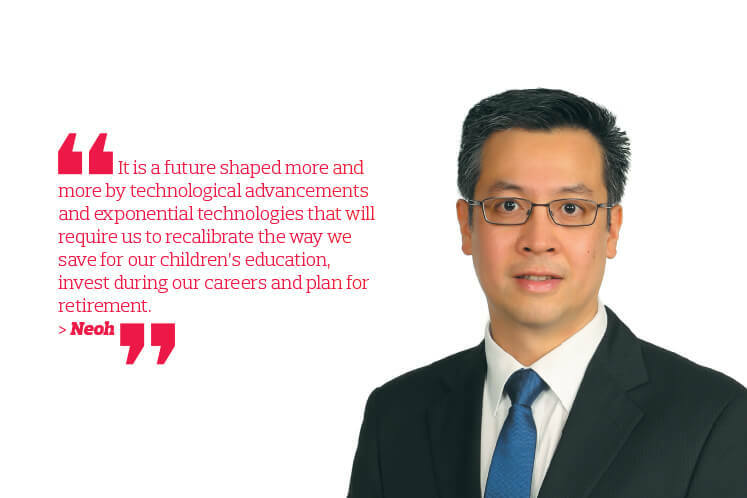 “It is a future shaped more and more by technological advancements and exponential technologies that will require us to recalibrate the way we save for our children’s education, invest during our careers and plan for retirement. Reskilling and upskilling will be part and parcel of the mini-retirement and career change process. So, I think no one should feel that they are past their prime as learning will be a lifelong affair,” says Neoh. Senior citizens, particularly knowledge workers, become more – not less – valuable as they mature. So, those who are fortunate enough to forge something of a perfect fit between their character, personality and interests will find far more satisfaction in working and contributing to society than wasting away on a rocking chair or in front of the television, says Devadason. “In my own case, it has taken me years of doing what I consider to be meaningful work that helps many people to get to the point where I categorically love the work I do. Now, since I love the work I do and because I believe it helps my clients and their families live better lives now and in the future, why on Earth would I want to retire on schedule or even early?